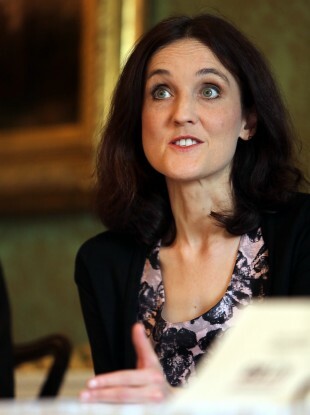 Theresa Villiers speaking at a conference in April. THE SECRETARY OF State for Northern Ireland has called for a Republican parade set to be held in Castlederg, Co Tyrone this weekend to be called off. Theresa Villiers MP made the comments following a meeting with representatives of the Derg Valley Victims’ Voice opposed to the parade set to take place on Sunday. The march commemorates two IRA men who were killed in a bomb they were planting in Castlederg in 1973 – one of the most bombed towns in Northern Ireland. She added the parade was “damaging to community relations” and called “upon the organisers to think again and call it off”. It is not in Villiers’ powers to stop the parade but she can liaise with the Parades Commission who are authorised to restrict routes and they have ordered that the parade stay away from the town’s war memorial. Sinn Féin members believe Villiers should stay out of parading issues as she should be seen as a neutral figure. Ruairí McHugh, Sinn Féin Councillor for Castlederg told TheJournal.ie that Villiers should focus her interests on “more serious issues”. He said it shows she has an “agenda” when she shows “concern for republican parades but yet she does not show the same level of concern when Loyalist parades take place”. The parade controversy comes just a month after the restriction of the annual July 12 Orangeman march, which caused five nights of rioting with a number of police and protesters injured. Email “'Call off' the Republican parade in Tyrone urges Villiers”. Feedback on “'Call off' the Republican parade in Tyrone urges Villiers”.